Sunday is a wonderful, long overdue day for American’s disabled veterans. The American Veterans Disabled for Life Memorial or AVDLM opens. It will honor the more than three million disabled veterans in this country. These veterans protected our freedom. They deserved to be remembered every day. To read some of their stories go look up The Disabled Veteran’s Story by Miguel Reece. If you are in Minneapolis this week, come and see an upcoming author named Paul Czajak. He is the author of the Monster & Me series. His first book is Monster Needs a Costume. He will appear in Maple Grove at the Barnes & Noble at 6pm and in Roseville this Friday at 6:30. He will also be at Kimberly Lane school and Gleason Lake Wednesday and Thursday. He will end his week at the Heartland Fall Forum at the Minneapolis Depot. Come support a new author! November 11, 2014 is Veteran’s Day. As a way to say thank you, go to https://twitter.com/ThankVet and post support for a vet in your life. Veterans just want acknowledgement and our support. We need to thank them every day not just on holidays. Please #thankavet in your life. This idea was based on the book, The Disabled Veteran’s Story by Major Miguel Reece. Be sure to tune into the Micheal Dresser Show this afternoon. Major Miguel Reece will be interviewed about his new book, The Disabled Veterans’ Story. He will discuss why he wrote the book and how veterans can get better treatment. Go to www.MiguelReece.com and http://www.blogtalkradio.com/michaeldressershow for more information. It should be a fun interview! Wow! What a week in the NFL! Sports are amazing in this country and around the world for that matter. We build up our celebrities and sports heroes and then rip them down. But sometimes a system needs a wake up call. Athletes have always been treated differently. Because they have a special ability to throw a ball, we give them free items, let them pass through school, and offer them millions of dollars yearly. Imagine if we lived in a world where teachers, factory workers or nursers were treated the same? I’m not surprised by the issues of domestic violence going on in the NFL. The athletes are treated like they are above the law and many times the system supports it. What is surprising is the Americans who are so in the dark about the sport and their real objective. The objective is money. Pure and simple. They are a business and want to get the most out of a person they can. Good afternoon! Today is a beautifully sunny day! I hope all is well in your worlds. Rosh Hashanah is the upcoming Jewish holiday. 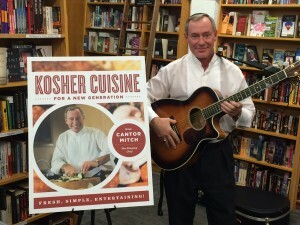 I have a wonderful author named Cantor Mitch who is making appearances all over the country to talk Kosher foods. He just released a cookbook called, Kosher Cuisine for a New Generation. It is about nontraditional kosher cooking. 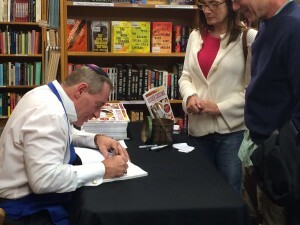 He recently was on Fox as well as had a great book signing last Saturday at Magers & Quinn. Go to www.CantorMitch for more information. He will be at the Barnes & Noble in Roseville, MN HarMar Mall this Saturday at 2! My husband and I decided to unplug in August. We took a good, long look at our cable bill and our TV watching habits and decided to cut the cord. I love Turner Classic Movies but I was paying almost $100 per month to watch a few channels. So here is how it went. We arranged phone and Internet with another provider and made the call to our current provider to cancel. It took 5 minutes! I problem. I was shocked! Then came the fateful day when they turned off the cable. We have basic, I mean I need national news! Then we have really basic channels like MeTV. Here is what I discovered. I have much more time! We bird watch, talk to each other more, get more sleep and enjoy life more! I’m also really enjoying CHIPs again. Erik Estrada was really good looking. I recommend cutting the cord. The entertainment industry is moving away from cable and guess what, we don’t need it to keep us entertained. We can do that our selves. I’m back blogging as I was on vacation most of last week. I wanted to mention the passing of Joan Rivers. Such as great loss! You either loved her or hated her but no matter what she made you think and laugh. She will be missed!